Creating a portfolio website to showcase your work and give you a valuable online presence is an effective way to promote your services and reach prospective clients. Whether you are a designer, photographer, or other creative type, you need a website that reflects the quality of your work and impresses your audience. So how do you make an online portfolio site? In this article, we will look closely at how to make an online portfolio. We will consider the features a successful site needs, and discuss step-by-step how to create a portfolio site using both WordPress and Wix. By the end of reading, you will have a clear understanding of how to build your own online portfolio. 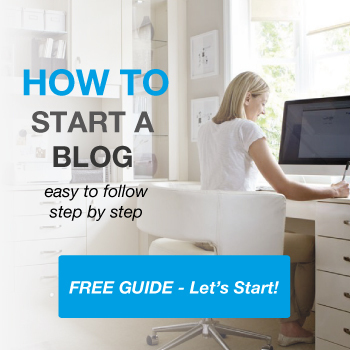 Affiliate Disclaimer: This guide contains affiliate links. When you buy items through links on our site, we may earn a small commission (at no additional cost to you). This helps us run makeawebsitehub.com and to keep all this amazing content free to use. 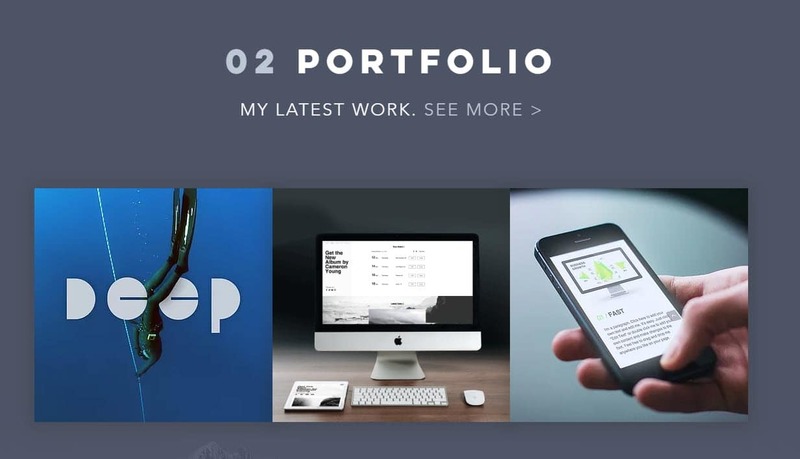 Why Should You Create an Online Portfolio? Creating an online portfolio is an effective way to showcase your business and work at its best. An online portfolio can promote your business and skills, explain to potential clients and customers what you do, and help establish your brand as professional, reputable and trustworthy. Done right, making an online portfolio will also help you reach new clients, generate leads, and gain exposure for your business. Remember, an online portfolio is available to clients 24/7. So whenever they decide to connect with your business, day or night, your online portfolio is there ready to help market your services. There is a wide assortment of tools and software that will enable you to easily create a stunning online portfolio. In this guide, we will concentrate on two main platforms that you can use to create your own portfolio site – WordPress.org and Wix. We have chosen these solutions as they are both extremely user-friendly, and will ensure that you can quickly and easily design a stunning online portfolio site that engages with your audience. You might also want to read my best free online portfolio builders guide as well. WordPress.org is a free open source software that will enable you to make an online portfolio site that suits your exact requirements. The WordPress community spans the globe, with businesses, designers, and developers alike providing a range of free and premium products and support. Unlimited Customization Options (whether you want to code your own website, use a live drag-and-drop page builder, or modify your site using the theme options panel, you will be able to customize any and all elements of your website. To be clear, when we discuss WordPress in this article, we are referring to WordPress.org, not WordPress.com. For more information on the differences between these two solutions, check out our article WordPress.org vs WordPress.com – Which is Right for You? Evidently, both WordPress and Wix have much to offer anyone who wants to make an online portfolio site. For more information on both of these solutions, and to help you choose which is the right tool for you, take a look at our article Wix vs WordPress. 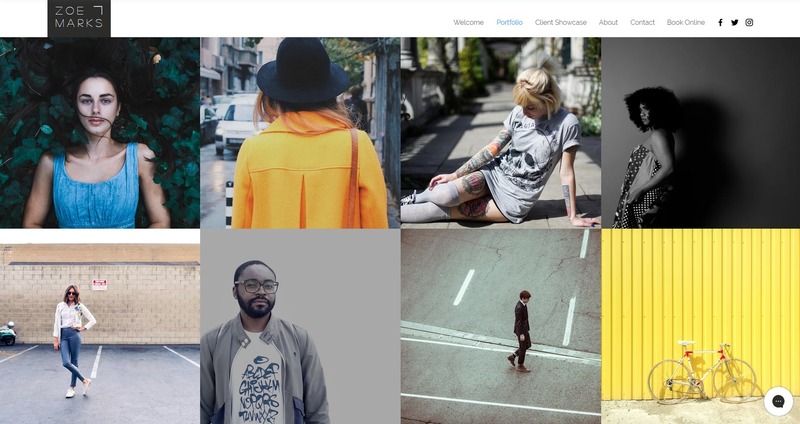 What Should an Online Portfolio Look Like? Your homepage is an introduction to your business and must impress. 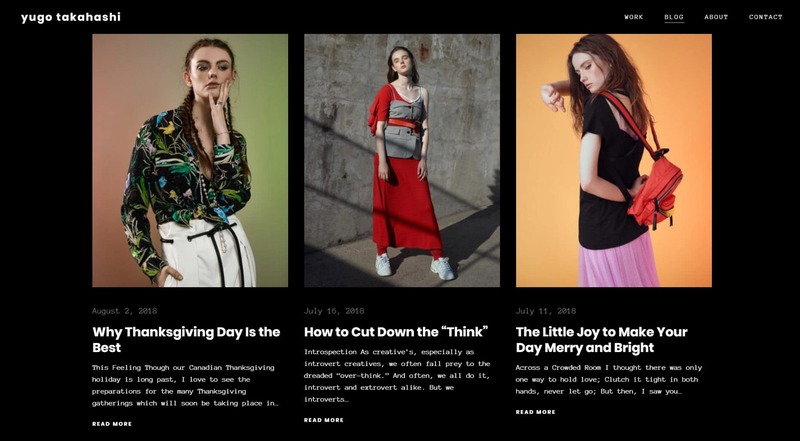 Bold images or video, an attention-grabbing color scheme, and some straight talking text will help you immediately connect with your visitors as they land on this page. Although you don’t want too much text on your homepage, some welcoming explanatory sentences as to who you are and what you are offering can go along way to engage your visitors and keep them on your site. Navigation on your homepage is also key, signposting your important content and encouraging your audience to click through to other pages to check out your work, testimonials, and more. Showcasing your work is arguably the most important aspect of a portfolio site. Potential clients want to gauge your skills and experience, see the quality of your work, and find out who you have previously worked for. This is a where you need to make an impact, so don’t display all your work, just a selection of your most recent and most show-stopping pieces. When choosing work to include in your portfolio, select projects that will inspire visitors with your creativity and professionalism. Provide context for your work, adding a brief description of each piece, so your audience has an idea of what each project entailed. And make sure you keep your portfolio site updated, adding new work if and when appropriate. Depending on your industry, you may want to add a services page. This is where you lay out what you offer, so your potential clients can get a clear understanding of your services and packages. 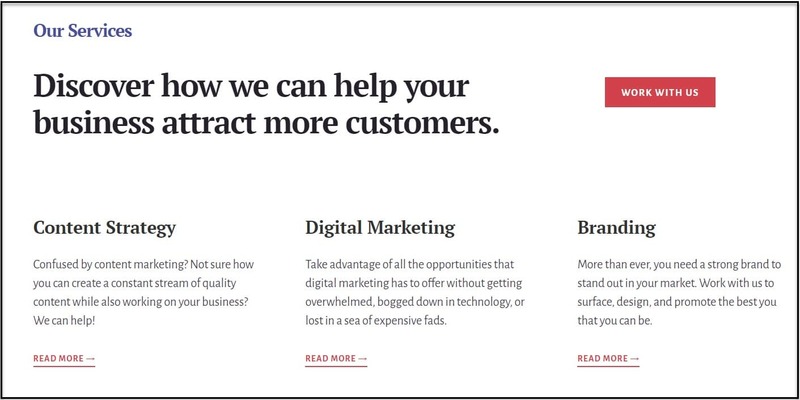 Your services page needs to be well laid out, with text that gets straight to the point. Visitors should be able to sum up your services within seconds of landing on the page. If the services you offer aren’t extensive and don’t warrant a whole page of their own, another option is to display your services on your homepage. I would also recommend not sharing prices on your portfolio site. Withholding prices enables you to collect email addresses, sell your services when clients get in contact, and even adjust your prices depending on the job. Most prospective clients will want to see who you have worked for previously, and what they thought of your services. Providing a number of testimonials from happy customers is an effective way to prove your value. Collect short quotes from reputable clients, along with photos if possible, to give your testimonials a personal touch. Again, if you don’t have enough testimonials to warrant their own page, add them to your homepage. Your about page is also important as it will help you build relationships with future clients. Share your work experience, values and ethos, qualifications, and a bit of personal information. Ensure your bio reads well, sounds human, and even contains a bit of humour. This will help endear you to your audience. 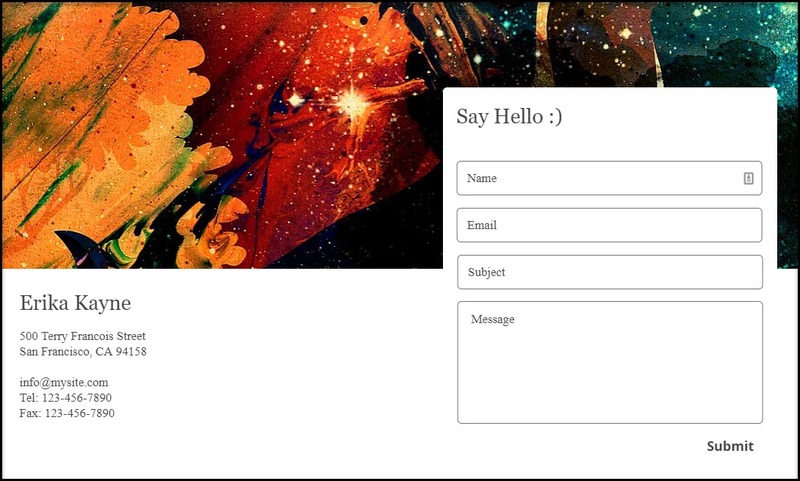 Contact Form – Display a user-friendly contact form so potential clients can immediately contact you without even leaving your site. Email Address – Adding your email address to your contact page is another great way to encourage your audience to get in contact with you. Using a professional email address is preferable. Physical Address – If you have a brick and mortar premises, and it is relevant to your clients and customers, list your address on your contact page. Telephone Number – If you are happy for people to contact you via the telephone, provide your number. Opening Times – if you run a shop or store, then adding opening times to your contact page is a must. Google Maps – Again, if you have a physical premises, then you should consider adding a map of your location to help people easily find you. The layout of your contact page is very important. Make sure it is clean and uncluttered, so visitors aren’t distracted from the job in hand – contacting you. SEO – Google likes to see your website is frequently updated, so posting on your site’s blog is an effective way to achieve this goal. A variety of targeted blog posts will also help your content rank for keywords, which in turn will help your target audience find you in the search engines. Reach a Wider Audience – Producing blog articles will give you and your site’s visitors content to share on social media. This, in turn, will help give your content exposure to a wider audience and drive new traffic to your website. Build Trust with Potential Customers – A blog will help you connect and build trust with potential customers. By answering their questions via articles, you will portray yourself as an expert in your industry or niche, and become their go-to blog for advice and news. For more information on creating a prosperous blog, check out our article How to Write Effective Blog Posts that Gets You Traffic. Creating an online portfolio with WordPress is a quick and easy process, which will result in a stylish, professional, and user-friendly website. There are a number of steps and decisions to make when building a website with WordPress, so we will now discuss each stage of the process, including a range of hosting plans, WordPress themes, and plugins, that you can choose from to ensure your online portfolio is prosperous. Your new portfolio site will need a domain name that reflects your business. Domains can be registered at Domain.com, NameCheap, or via a number of other domain registrars and web hosts, and will cost around $12+ a year. If possible, use your business’s name, or a name or phrase that is relevant to your brand or niche in some way. Try and choose a name that is memorable, so it will stick in your visitors’ heads and come to mind when they want to revisit your site. For anyone struggling to come up with a name, using a domain name generator can help. Selecting the right hosting provider for your portfolio website is an important job. With hosting, the rule of thumb is that you get what you pay for. So don’t just choose the cheapest hosting package you can find. Bluehost – A great all-round web host with high uptime levels and fast load times, Bluehost is a great choice for small portfolio sites. Hosting packages include a free domain and SSL certificate, as well as a one-click WordPress install. Prices start from just $2.95 a month. HostGator – Offering a range of hosting packages, as well as effective WordPress specific hosting, HostGator is another great choice for anyone building an online portfolio site with WordPress. The WordPress cloud hosting plans include SSL, 1GB of backups, advanced security and more. These plans start from just $3 a month. SiteGround – Well known for its excellent 24/7 customer support, SiteGround is perfect for those unsure about running a self-hosted website. Offering fast and secure hosting, other features include free SSL, email, Cloudflare CDN, daily backups and much more. Prices start from $3.95 a month. Although these are three of the best hosting providers, there is a wide assortment of hosting services and packages that cater for any need. To learn more about hosting your WordPress website check out these reviews of the Best WordPress Web Hosts. Once you have selected and paid for your hosting package the next step in the process is to install WordPress. There are a number of ways to do this, but the quickest and easiest is to let your hosting provider take care of it. If you have chosen a reputable host with WordPress experience then they will offer a one-click WordPress install, or even provide WordPress pre-installed. This really is as simple as it sounds. Either allow your hosting provider to install WordPress with just click, or you will find WordPress has been already installed on your website. If you would rather, you can also install WordPress manually, which we have written about in our article How to Install WordPress. You have now come to the difficult step: finding the right WordPress theme for your project. Luckily the difficulty is making a decision between the numerous stunning high-quality portfolio themes that are available – so not a bad problem to have! 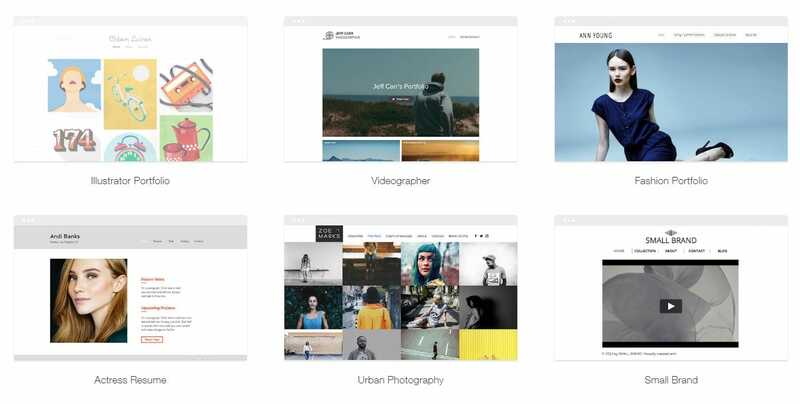 There is an extensive selection of free and premium WordPress portfolio themes to select from. However, if you want your site to look truly professional, and contain the necessary features to connect with your audience, then you should consider opting for a premium theme. Themeforest is a theme shop that provides a range of beautiful WordPress themes. However, there are also many theme developers that sell their themes independently, including StudioPress, Elegant Themes, ThemeFuse, WPZoom, and many more. A multipurpose theme from Elegant Themes, Divi ships with a portfolio layout pack, enabling you to install portfolio pages, layouts, and content to help quickly shape your new portfolio site. You can also use the Divi builder to customize your website to your exact specifications. 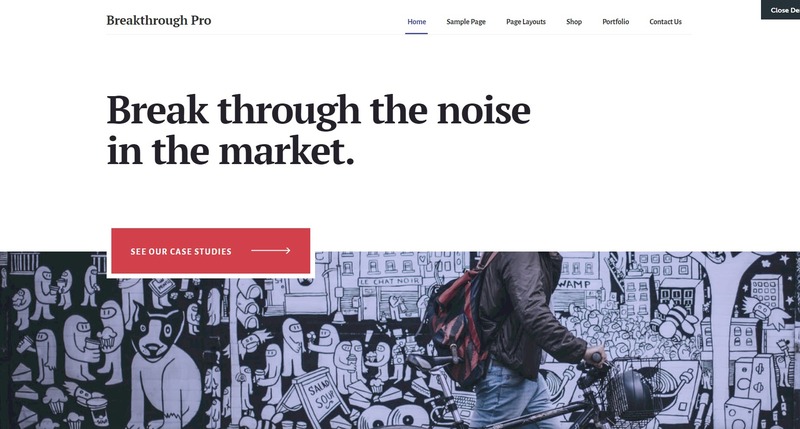 Breakthrough Pro is a beautiful portfolio theme from StudioPress. Containing a selection of portfolio page templates and layouts, as well as a stunning gallery page, this theme is perfect for demonstrating your work, services, and creativity. Skylab is a popular WordPress portfolio theme that you can purchase from ThemeForest. 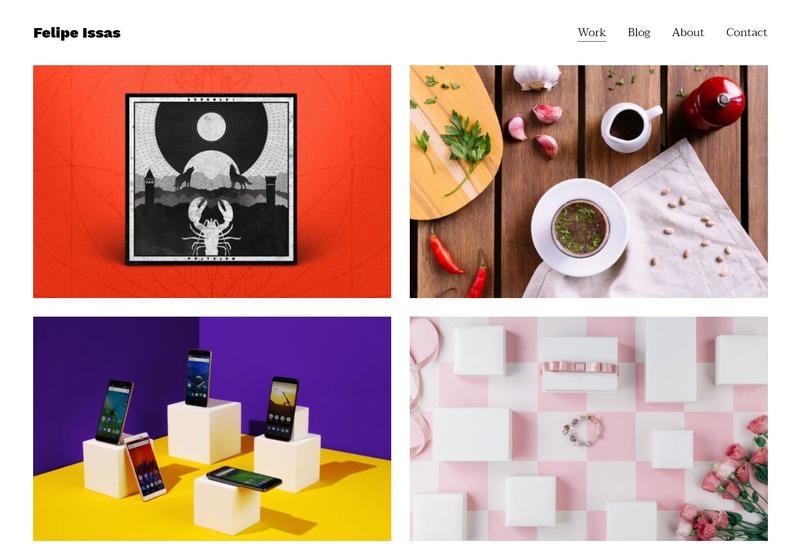 This feature-rich theme ships with a 12 stunning portfolio demos, that can be easily customized using the drag-and-drop page builder. Remember, before you purchase a theme, make sure you do your research. Check out the demo, read reviews, and double check it has the features you need. Live Customizer – Using your theme’s live customizer, you can alter your site’s color scheme, change the background and header image, add to the menu, and much more, all in real-time. Page Builder – Some premium themes come with built-in page builders, or you can install a page builder plugin if you are keen to have more control over your site’s design. A top-end page builder will allow you to modify every aspect of your website, often on both the front and back end of your site, using drag-and-drop features to ensure you don’t have to touch a line of code. Of course, with WordPress, there is also always the option of coding your own portfolio site, enabling you to make an online portfolio to your exact specifications. 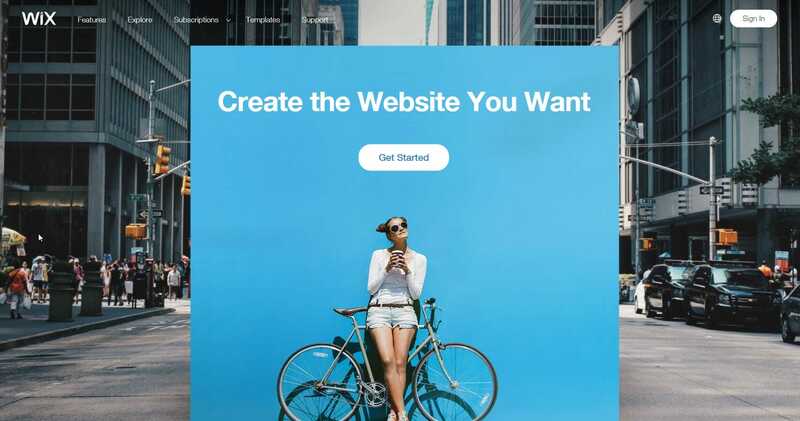 Ninja Forms – Create and display attractive forms on your portfolio site with this powerful form builder, helping your site’s visitors to easily connect with you. OptinMonster – A premium tool, OptinMonster will enable you to add a range of pop-ups and opt-in forms to your site, increasing lead generation and conversions. Envira Gallery – If you are looking for an advanced portfolio plugin, the Envira Gallery is for you. This premium plugin will enable you to add unlimited galleries and albums to your website, showcasing your portfolios of work at their best. Soliloquy Slider – Create fully responsive sliders in minutes and wow your audience with this top rate premium slider that will display your work in style. Monarch – Created by Elegant Themes, this premium plugin will add beautiful social share buttons to your posts, pages, and images, encouraging your audience to share your work on social media, and giving your business exposure to a wider audience. For further information on using WordPress plugins, have a look at this list of 48 of the Best WordPress Plugins for Business Websites. 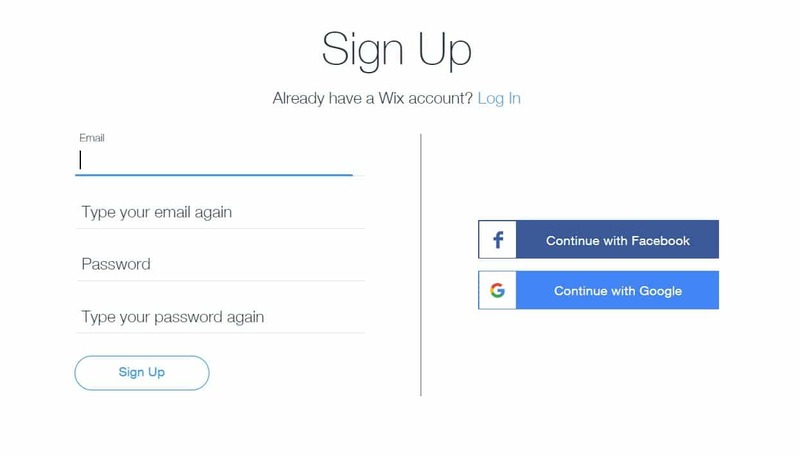 Signing up with Wix is a quick and easy process. Simply open the Wix homepage and select Get Started. Then follow the instructions, signing up with your Gmail or Facebook account, or another email address. Wix will now ask you a series of questions about your project, and it is here you can choose to opt to use Wix ADI or the Wix Editor to create your website. 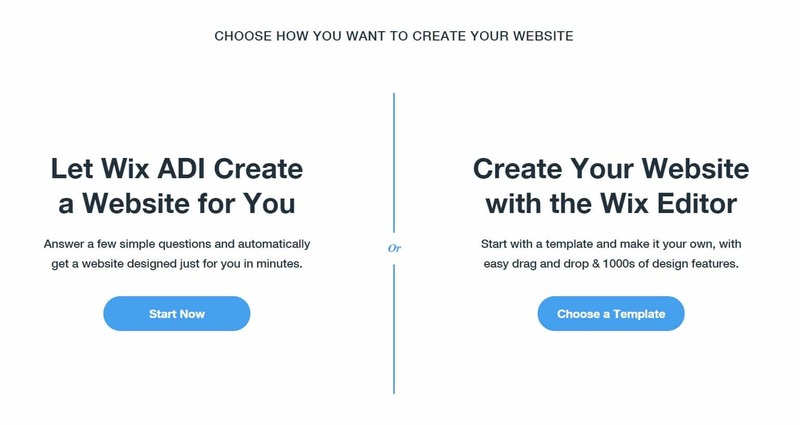 Wix ADI uses artificial intelligence to design you a website based on your specifications. Although a good tool for total beginners, the Wix Editor offers superior customization options, making it a better choice if you want a website that shouts ‘WOW’! Once you have selected to design your site using the Wix Editor, the next step is to choose a template for your online portfolio. Wix provides over 500 templates with a plethora of portfolio specific templates catering for a range of industries and niches. Scroll through and view the demos for each template until you find a best fit for your project. Menu and Pages – Your template will already contain all the necessary pages for a portfolio site. However, if you would like to add or delete any, simply select Menu and Pages from the left-hand menu. Background – To change the background image on each page, select Background from the left-hand side menu and then change the color and image, or add a video. You can upload your own media, select from free Wix media, or purchase from Shutterstock. Text – Alter the text by simply clicking on the existing text and rewriting. You can then change the fonts, colors, size, positioning, and much more. Add Extra Design Elements – The Add icon allows you to select any extra design elements that you might want to add to your portfolio site. From galleries and lightboxes to social tools, you will be able to find a range of extras here to suit your needs. Add Apps – Wix provides a wide assortment of free and premium apps. So whether you need a lead generation tool, a form builder, or a show-stopping slideshow, the Wix App Store should have an app for you. Select Preview from the menu to check how your site is progressing, and don’t forget to Save your work. When you are happy with your site select Publish from the main menu. 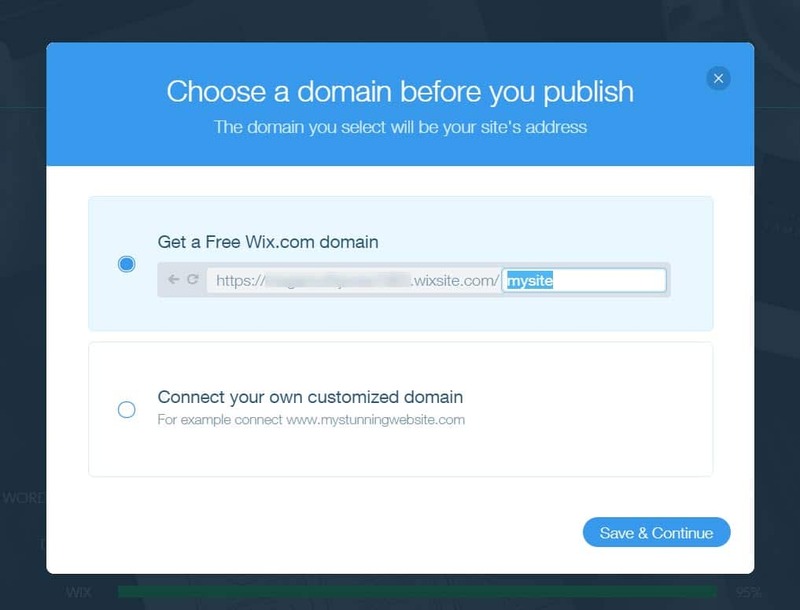 You will now be asked to choose your site’s subdomain, create your own domain name, or connect a domain. If you want to use a domain that doesn’t include /wix.com, then you will need to now opt into a premium Wix plan. Wix prices start from as low as $5 a month. Once you have selected a Wix plan, your site will be live for clients to browse. PortfolioBox – A tool for creatives, PortfolioBox provides a wide assortment of design, marketing, and eCommerce features, enabling you to easily create a unique and stylish portfolio site. PortfolioBox also offers both a free and premium version of its service, making this tool accessible to all, whatever your budget. 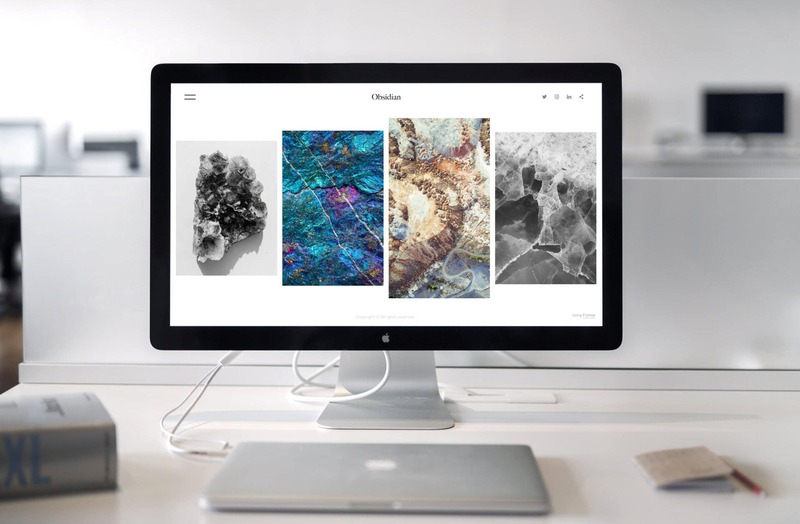 Adobe Portfolio – Providing a range of themes, pages, galleries, and numerous portfolio related features, Adobe Portfolio will enable you to design a stunning and professional portfolio site. What’s more, when you purchase Adobe Portfolio ($9.99 a month), you’ll get access to Adobe Fonts, Photoshop, and Lightroom. Evidently, there are a number of effective and user-friendly solutions that will enable you to build a stunning portfolio site. They are all impressive options, so have a browse of each and get a feel for which platform would be best for your project. Then, once you have made your decision, its time to get designing. Good Luck!